The Thailand islands are a stunning holiday destination offering a diverse range of culture, cuisine, activities, adventures and experiences. Boasting stunning beaches, bargain shopping, exotic cuisine, excellent surfing and spectacular snorkelling, the Thailand islands offer a range of natural and cultural attractions. Featuring comfortable, modern accommodation and plenty of shopping, dining and famous nightlife options, the Thailand islands enjoy a great range of family friendly activities as well as attractions to suit couples and party goers. Phuket: Set in the Andaman Sea, Phuket is the largest of the Thailand islands and is also the most popular. Home to wonderful beaches, plenty of accommodation and plenty of great food, Phuket is also renowned as a party and nightlife capital, however there are plenty of relaxing activities and natural attractions to enjoy. 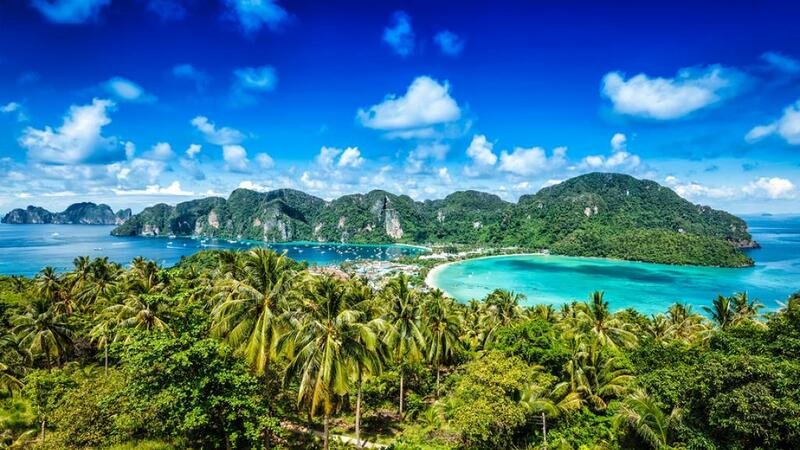 Phi Phi Islands: The picture perfect Phi Phi islands boast pristine white beaches, crystal clear water and some of the best snorkelling in the country, particularly on Phi Phi Ley. Phi Phi Don on the other hand is renowned for its nightlife and vibrant atmosphere once the sun goes down. Krabi: A stunning province on the coast, Krabi is a natural wonderland home to stunning beaches, unique limestone rock formations, caves and cascading waterfalls. The ideal place to relax and soak up the beauty, much of Krabi is designated as National Park and offers excellent scuba diving, snorkelling and ultimate relaxation. Khao Lak: One of the hidden gems of the Thailand islands, Khao Lak offers miles of pristine beaches that stretch into lush forest surrounded by three national parks. This stunning stretch to coastline was largely undeveloped up until recently and the atmosphere remains intimate with a focus on nature rather than nightlife. Koh Samui: Located on the east coast, Koh Samui offers the perfect balance between luxury resorts and a relaxed and natural atmosphere. Featuring beautiful beaches and a surprising array of nightlife options, the destination offers all the charm of the local lifestyle and is a great place to soak up the sun, culture and cuisine. Koh Chang Island: Closer to the border to Cambodia, Koh Chang Island is Phuket's second largest island and is part of the Marine National Park. Recently added infrastructure has made visiting this natural wonderland much easier, and visitors can enjoy everything from fishing and scuba diving to elephant treks and much more.